On her seventeenth birthday, Cassia meets her Match. Society dictates he is her perfect partner for life. Except he’s not. In Cassia’s society, Officials decide who people love. How many children they have. Where they work. When they die. But, as Cassia finds herself falling in love with another boy, she is determined to make some choices of her own. And that’s when her whole world begins to unravel . . .
Oh wow. 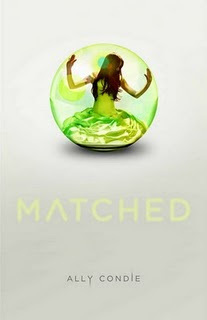 How much did I loved Matched?! I'd really love to count the ways with you... But before we begin, a big thank you to Lynsey for organising this ARC tour, and for Splendibird for sending it on to me! I had fantastic time with this book. First, let me tell you that I LOVE reading dystopic books. There's usually something a little creepy or sinister lurking about. And Matched is no exception. Slowly we're introduced to the world that she lives in where everything is controlled. Who gets married to whom, the portions of food consumed, which clothes are to be worn, jobs, locations, even each person's time of death. This amount of control didn't seem like it was much of a problem at first, everything seems geared to giving people happy, long and stable lives. And then more and more is revealed and suddenly, for Cassia, it feels a little suffocating. Is there any point in struggling against the system? Will one person make a difference? Other things are controlled as well. The officials decided long ago to limit the number of songs and paintings and poems to a hundred of each. It broke my heart to hear of such a thing. How would you pick out only one hundred songs or poems or pieces of art to keep and which to destroy forever? Poetry plays a big part in Matched, and though I don't read a lot of poetry, I've been inspired to read Dylan Thomas. But even though poetry and paintings and songs are limited, that doesn't stop people from remembering. Nobody can take that away. But of course, aside from this new Society that Condie has created, she also gives us some wonderful characters. Characters to fall in love with. There's Cassia, a little naive to the world that she's living in, a little easy to believe everything she's told and a bit resistant to see how much of her life is controlled and manipulated by The Officials. Her parents, who are supportive of both of their children in very different ways. Cassia's grandfather, who she's able to talk to the most about all of the changes occurring in her life, the one who tries to steer her into being more curious and wonder about her world. Steady, loyal Xander. Her best friend and her Match in every way. But is he? When Cassia sees another face as her Match, she does begin to wonder... is she meant to be with Xander, her closest friend? Or Ky Markham, a mysterious boy from the Outer Provinces? The boy who opens up to her, tells her his story and teaches her to create new things. There's such a high amount of romantic scenes in Matched. It had my heart absolutely ACHING. I loved Xander and Ky! I want them all to be happy. There's so many different types of love portrayed in this book, with all of Cassia's different relationships. And I also really adored the psychology aspect of the novel. With the Matching, the mind games, the levels of control, the pills. Ky even brings up a psychological theory - the Prisoner's Dilemma, which I studied last year on a psychology course. It makes for very interesting reading, this combination of a controlling society, psychology and a heart-wrenching love story. Matched is one not to miss! This has been read as part of a tour as well as for Presenting Lenore's Dystopian August! Highly recommended. Wow, what a review! So much detail. I will definitely be ordering a copy of this. The romance sounds so agonising and the level of control kind of fascinating. Great review... I can't wait to read this! It sounds a little like The Giver in some ways. Have you read The Giver? Did you notice similarities between it and this, or are the resemblances purely superficial? Omg Omg I'm glad you like this, because I'm slightly dying for it. Your review got me excited! Can't wait! REALLY glad you liked it Michelle, this is one of my top three books EVER. LOVED IT WITH A PASSION!